Your Life May be Shortened! World Health Organization (WHO) warn of an increase in cardiovascular events (strokes and heart attack) on severe days of pollution. Also, study by the School of Public Health, Hong Kong Faculty of Medicine for a period of 13 years has demonstrated, for the first time, the correlation between air pollution and death of the elderly in Hong Kong. The study showed an increase of 10 units in the concentration of fine PM2.5 particles in the atmosphere 22% increased the rate of cardiovascular events, the 42% rate of heart disease and 24% the rate of heart attacks . What are the short- and medium-term risks to my health? How can I protect myself and my children? How do I recognize the effects of air pollution? We have all noticed the changes in color of the sky and smell in the air. Pollution is a direct cause of my patients suffering from sinusitis, and also increasing the amount of bronchitis, nasal problems and asthma. It’s a scourge of modern health, worse in Hong Kong and China than anywhere else in the world. Anyway, let’s talk about what we can do to combat this. Index AQI : How to Follow The ‘Pollution Indices’ ? 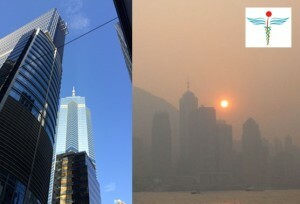 It’s not always easy for us to know if the habitual smoggy look of Hong Kong is a fine mist or a cloud of air pollution! It’s all grey skies! You will find the clues on the internet and also on two applications you can add to your phone: ‘Air Quality’ and ‘HK Air’. With 14 stations measuring air pollution throughout the territory that capture two things under the AQI. INDEX – AQI. This is the WHO index. For every gas they have maximum acceptable level for health, which they consider non-damaging to our health. Firstly, particles – that is solid particulate matter – or PM. PM2.5 is a new index, and these small particles are of a size that can do damage to the tiny lung vessels.The PM10 we have known about for longer, and damage the larger bronchioles of the lung as well as sinuses and nose lining. Secondly, gasses such as nitrous and sulphur dioxide (NO2, SO2, CO). Also, a big one – ozone, (O3) known to be the most irritating/damaging to the body. 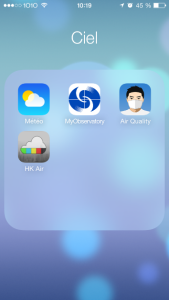 What Are The Most Polluting Gases in Hong Kong and Other Cities? Pollution in different cities have different causes. For example, in Paris, this is the PM10 large particles in the air. In Beijing PM2.5 small particles mainly from cars and heating. In Hong Kong? Small particle PM2.5 and ozone gas (maily from container ship fuel burning). Again internal combustion engines but mostly ocean vessels coming into port. It’s worse than this – PM2.5 and 10 are also represented beyond the acceptable thresholds WHO, (World Health Organization). Firstly, reduce your exposure when pollution levels are high. Reduce any intense sporting activities (eg running outside) when the government index 7 comes up. Suspend them completely when the index 10 is reached. Mainly all international schools have a pollution protocol that adapts sports according to these indexes. Wearing masks may be a good option protect the above pollutants. However not the little white paper ones, but proper gas masks ! yes, this sounds crazy, however people in Beijing need to do this. The solution ? I advise you to put a purifier in your room to clean the air you breathe every night. At night you breath 1/3 of your daily air! Of course, I can advise you on how and what to buy, without breaking the bank! How To Choose Your Air Purifier ? I also have a Philips purificator, which is less expensive at about $ 2,500. It can be found in Wing On, but may be less effective. A new study led by a researcher Hartford Environmental Health and published in “Environmental Health Perspectives” shows that air pollution actually affects our thinking. It highlights the areas that suffer: in planning , organization, difficulty in concentration and decision making, etc. (Studies were done in a poorly ventilated environment with volatile organic compounds). With many years experience in Hong Kong and I see several impacts: headaches, stomach, sore throat, extreme tiredness, when air pollution peaks. As a family physician, I always treat infections of the upper respiratory tract. In recent years, with the empire pollution, I see more sinusitis, allergies and bronchitis that I believe are related to our pollution in Hong Kong. The tiny particles (PM) and the harmful chemical gases irritate the lining of the nose that produces more mucus. This means they are more easily infected and susceptible to viruses and bacteria that circulate. Finally, I would like to reassure my patients, friends: I remain confident that we can firstly protect, secondly heal the onset of symptoms and strengthen immune defenses by different means, including specially imported supplements.